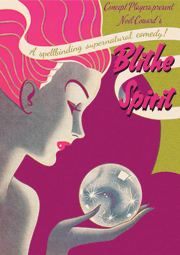 Blithe Spirit is, perhaps, one of Britain’s best known plays. Loved affectionately as it captures the wit of Noel Coward at his prime but also because we associate it with the film version. 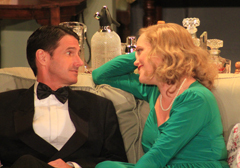 The film is a rarity – a good version of an excellent play. 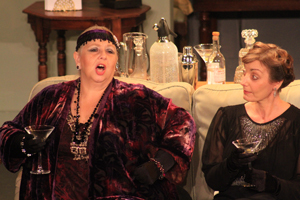 Perhaps some of our younger audiences don’t know who Rex Harrison, Margaret Rutherford, Constance Cummings or Kay Hammond were but for some it is their faces that are conjured up at the sheer mention of this play, always with a smile in tow but is a challenge for a director. And comedy is never an easy option. Noel Coward himself worried that the subject matter was beyond the pale when he first staged it in 1941 as death, and the possibility of life after death, was all too real for the British people during the war. 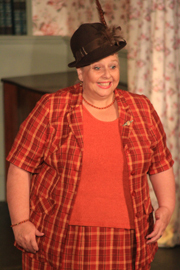 The title of the play is taken from Shelley's poem "To a Skylark", ("Hail to thee, blithe Spirit! / Bird thou never wert") and was written whilst at Portmeirion on a short holiday after his London office and flat had been destroyed in the Blitz. So you could say that it has Welsh roots! For us it was a great play to perform as it gave us a great challenge both in terms of its staging and the sheer wordiness of it! Thankfully our set designers were able to pull off what probably is one of the best set designs we ever had, correct in every 1940s period detail down to the Bakelite light switch. It looked plush and chintzy, like an over decorated vicarage, reflecting the style of the lady of the house. We had a stellar cast led by the wonderful Laurence who looked every inch the debonair, urbane writer Charles Condomine. 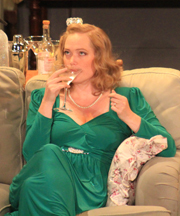 Ruth, his wife, was played by Ellie who dripped elegance and poise which was all the more funny when it all started to go wrong. The sharp repartee of their acting was electric, from their passive-aggressive repartee to their full-blown rows. 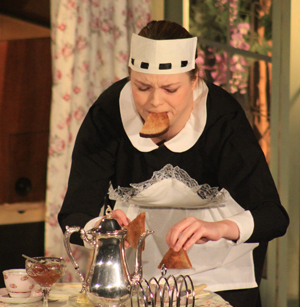 Edith the maid was refreshing played with vim and vigour by Cat and she stole the opening of scene 3 with a bravura piece of comic acting when laying the table for breakfast. One of the most famous parts of this pay is of course Madam Arcati. This part needs great comic timing and a over-the-top portrayal. Luckily we had just the dame - Helen. 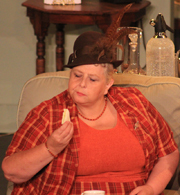 Helen was perfect as the slightly strange and batty clairvoyant who really did believe in her powers and although others expect her to be a charlatan, she is true to her own beliefs and this was palpable in Helen's portrayal. The audience loved her. The other famous part is Elvira, the first Mrs Condomine. 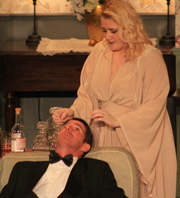 Rhiannon was back in a play, the first time since Bedroom Farce, which was some years ago and she was perfect as the sultry, manipulative dead spouse. She built up her presence well as she showed her true hand in her jealous plot to gain control of Charles. 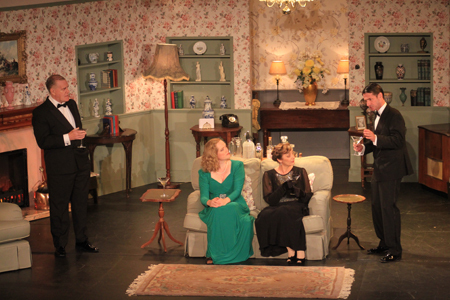 Finally the support was strong as we had Dr and Mrs Bradman, ably played with comic timing, which made the most of these roles, by Neil and Judy. Neil and Judy had their own dynamic as he tried to stop her babbling and she tried to prevent him boring everyone to death. Judy's crystalline laugh as she flirted with Charles Condomine was a little gem in their first scene. The action was fast paced and although a long play, everyone we spoke to said that we had got the best with what is a very intensely written play which demands the audience's attention as much as it elicits the audience's laughs. As the tension builds up the denouement of the play was of course the destruction of the beautiful set by the errant ghosts. The smashing of the chine figures, flying books, flashing lights, weird sounds, mysteriously playing radiogram was topped by a falling chandelier. A fantastic ending to a fantastic play. 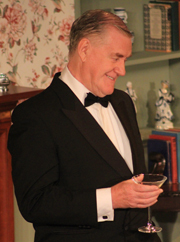 Ruairidh directed, having had much previous success with previous plays, Steel Magnolias, The 39 Steps and Lend Me A Tenor, and again he made the whole larger than the sum of the parts, a truly ensemble piece of theatre. Laura made the whole evening sound appropriately period and with her effects, suitably spooky, giving us surround sound of ethereal ghost voices during the séance. Ellie Morgan did a fine job of the lighting design and Aileen did well in her first foray into running the lighting board. Backstage Jess ran a tight ship ably supported by Kate. The whole thing was made perfect by the costume choices of the wardrobe team, Paul and Fiona who surpassed themselves with period dresses for the leading ladies which were perfect in every way. 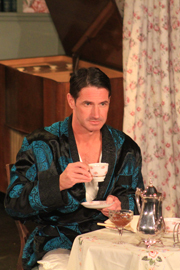 A mention too that the set had been constructed with a whole list of people helping, built, rebuilt and built again. We have remembered why we rarely do box sets that's for sure. So with a stellar cast, set, design, wardrobe and crew we pulled off this lovely piece of theatre and we think "The Master" himself would have been proud. It was hard work but it was worth it! We are proud to announce that we have been nominated in quite a few categories for this years' NODA District 4 awards . 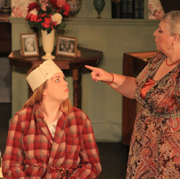 Best Stage and Technical: Blithe Spirit. 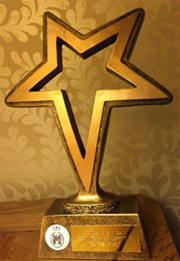 We shall find out who wins what at the annual awards in Hereford in May. And a good cucumber sandwich! 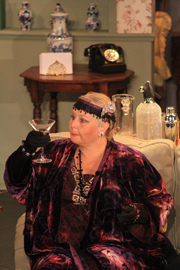 "The entrance of Madam Arcarti (Helen Windsor) was sublime and she gave the performance of a lifetime and the audience aching bellies from the constant laughter." 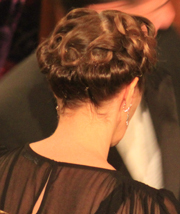 A special mention for the perfection that was Judy's hair!